It is a the story about Benjamin Esposito, an employee in court, who decides to write a novel about an old, unsolved murder case. A woman is brutally raped and murdered. They know who the murderer is but cannot find him. This is a not an ordinary murderstory. It is also a story about love. About love that never fades away nor dies. The love Morales feels for his murdered wife even after she is long gone, and the unspoken love Esposito has for Irene, his beautiful young boss. When writing the novel he relives his life and also reflects what he sees in Morales. Then there is also the clerk, a real geek and a drunk, who is Esposito’s best friend and not as stupid as he seems. The English subtitles were necessary, as you don’t want to miss anything of the converstions and the piropos (compliments given to women) for example “did a saint die last night? It’s just that an angel in black enters the room”, when Irene comes in, dressed in black. The end is really comletely unexpected. That is what I absolutely love about this movie. It is a movie that stays in your head for days and one of the few movies you never forget. Buy it, rent it, whatever, but watch it! 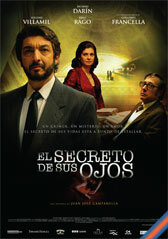 El secreto de tus ojos, a film by Juan Jose Campanella with Ricardo Darin and Soledad Villamil. Has won several prices. Update : 8/3/2010 : I suppose I am not the only one who liked the movie : this movie didn’t just win “several prizes”, but they even won an Oscar for “Best foreign language show”. I suppose this means that it will be showing in all the better cinemas around the world. Don’t miss it!